The elegant look of a hardwood floor can add warmth and character to any room in a home. 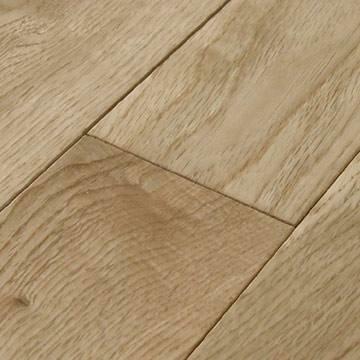 The natural characteristics of wood add depth and a visual appearance that many other types of floors try to duplicate. With the demand for hardwood flooring growing manufacturer's are enhancing their ranges to meet this demand, with better quality finishes and superior construction techniques. Solid Wood floors are one solid piece of wood that have tongue and groove sides and come in either pre-finished or unfinished styles. Solid wood floors are sensitive to moisture and it is not recommended to install these floors below ground level, or directly over a concrete slab. These floors are for nail-down installations only. You can refinish, or recoat solid wood floors several times, which adds to their appeal and to their long life. There are solid floors that are over 100 years old and are still in good condition. Engineered Wood Flooring - These floors are constructed from several wood plies that are glued together. The centre core is generally a softer wood material and is used to make the tongue and groove. A hardwood finish layer is glued on top of the centre core and another softer wood ply is attached underneath the core. 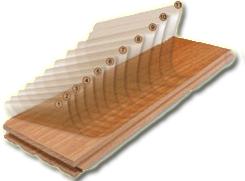 This top ply is also called the finish layer and can be constructed of almost any wood specie. Veneer Wood Floors are very similar to laminate floors. The only difference is that with a veneer flooring to top wear layer is a thin piece or real hardwood instead of a photographic image as in laminates. 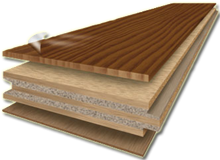 Veneer flooring is usually around 8mm in thickness with the top hardwood layer being around 0.7mm. Advantages of a veneer floors are that they are fast and easy to install and you have a real hardwood floor. UV-cured Factory finishes that are cured with Ultra Violet lights versus heat. Polyurethane A clear, tough and durable finish that is applied as a wear layer. Acrylic-Urethane A slightly different chemical make up than Polyurethane with the same benefits. Aluminium Oxide Added to the urethane finish for increased abrasion resistance of the wear layer, which is becoming extremely popular on the better grade wood floors. Acrylic Impregnated Acrylic monomers are injected into the cell structure of the wood to give increased hardness and then finished with a wear layer over the wood. Nail Down Secret nails are used with a wood flooring nailer and mallet to attach the flooring to the sub floor. 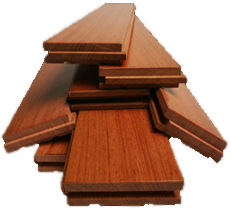 Solid Strip floors or Plank floors can only be installed on wooden sub-floors or on batons. 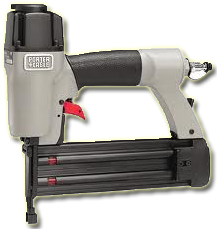 Glue Down Engineered wood floors and parquets can be glued down. This is when you spread the recommended glue all over the sub floor and lay the flooring into the glue. Floating This is when a thin underlay is placed between the wood flooring and the sub floor. A recommended wood glue is then applied in the tongue and groove of each plank to hold the planks together. Engineered & Veneer floors can be floated. This is a very fast, easy and clean method of installation.